The Kings Arms in Askrigg was the real name of the pub we used as The Drovers Arms in All Creatures Great and Small. I returned there seven years ago when I was writing a feature for the Mail on Sunday. I ordered a glass of red wine and sat alone, deep in reflection. 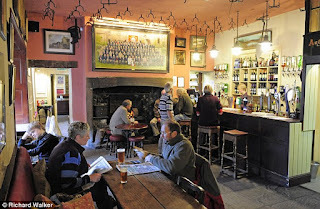 In the days when it was the Drover's Arms, late 1930s to 1940s, it certainly wouldn't have served red wine by the glass! I remember my very first bout of filming for the television series All Creatures Great and Small, it was autumn, late seventies. The three actors playing the leading roles of the vets in a Yorkshire practice had already been on location for a week or two. It was about then that I arrived in Richmond to complete the quartet of players. Although we didn't know it at the time, we were to continue working together very happily for many years. To celebrate our newly-bonded foursome, Robert Hardy, the wonderful late Robert Hardy, threw a dinner party at his hotel, the Punchbowl Inn, Swaledale. The hunting season had just opened and the grouse were delivered to the table almost fresh from the fields. I was a little horrified, partially because, during those years, I was a vegetarian. Up until that time, I had been an impoverished actress living from job to job, praying a role would fall into my lap so that I could cover the next electricity or telephone bill. Robert Hardy's dinner party was lavish, certainly by my standards. I can see him now - (to his close friends, he was Tim, not Robert) - at the head of the table relishing every second of the evening, ordering this and that with gusto and taking great care to make sure that the wines were the ideal companions to each course. He called for two bottles of 'claret' to accompany the main plate. I think I can honestly say I had never heard of 'claret', or if I had, I could not have said which or what wine, or range of wines, it described. I would not have dreamed of asking because I was too awestruck by the company and the splendour of the occasion and because I thought it would be expected of me to know such details. I have since learned that the notion of 'claret' is a very English one and refers to red Bordeaux wines. However, the origin of the word comes from the Latin, clarus, clear, and then pale. It was used originally to describe light wines, usually a pale red in colour or even yellow. 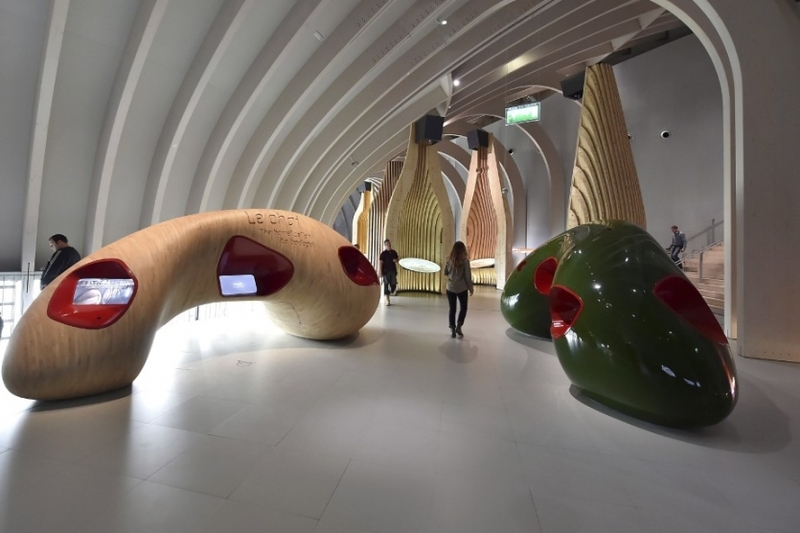 La Cité du Vin, Bordeaux's new museum dedicated to celebrating its most famous produce. Bordeaux has come on leaps and bounds since those Middle Ages days of wine-making where the wine almost resembled a rosé. Bordeaux is now world famous for its full-bodied reds. It was the British who first used the word claret sometime in the 1700s to describe those dark red wines. I recently paid a visit to the city of Bordeaux. While there, Michel, my husband, and I decided to take the time to see its newly inaugurated museum, La Cité du Vin, where you can happily spend four or five hours learning the history of wine, its place in the world, its place in literature and the arts and round off your outing with a wine-tasting on the eight floor with stunning views over the city. The building itself is well worth pausing over. As you can see from the photograph above, it sits between city and river and it is not conventional architecture. Its facade, made up of silk-screen printed glass panels and perforated, lacquered aluminium panels, gleams in the sunlight like a polished ducat, or a magical golden boot. 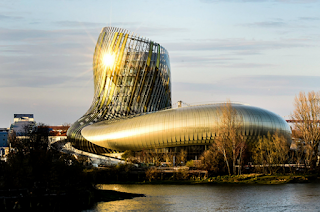 In fact the architects, Anouk Legendre and Nicolas Desmazières, have attempted to create the movement of both wine splashing into a glass and the movement of the Garonne river which flows at the foot (the toe) of the building. They also claim they were inspired by and have attempted to capture the trunk of a gnarled wine plant. Whether you see that or not, the edifice really is a dazzling sight and, like both wine and water, its appearance changes with the light, the time of day, the weather. Its interior is equally innovative and pleasing. It is exceptionally spacious. There is none of that cramped feeling frequently common in more conventional museums. In fact, at some moments this is more a Son et Lumière show. There is a wealth of material to learn and discover - plenty of areas where the information is highlighted with short animated sequences, which make it ideal for children. There are cinemas, one in-the-round which is visually so exciting.There are other areas where you can sit at a table as though in conversation with such luminaries as Voltaire and listen to him or many other historical greats give their opinions on the role of wine in their/our lives. This area resembles giant wine bottles sliced in half. Elsewhere, you can learn a little of what wine has meant to the Church, to Jewish communities, to the Holy Land, Egypt, to Europe's elite, and plenty more. The Holy Land stop along the Cité un Vin journey took me back to a very special experience of my own when I was in the West Bank with a group of Israelis from Tel Aviv. We were planting olive saplings paid for and transported to the fields by my Israeli companions. We were there to replant several Palestinian groves that had been destroyed by the IDF and neighbouring Settlers. Someone at my side, a stranger, said to me as we stared into the sunny distance on that late February Saturday: "This land, as far as the eye can see, has been producing olive oil and wine for at least three thousand years." Palestine was supplying wine to Egypt circa 3100 BC. In ancient times, Palestinian wines were consumed by everyone as a social experience and for alimentation and medicinal purposes. The story of wine, I was thinking to myself, is possibly almost as old as that of olive oil. After our afternoon of discovery we took the exceedingly efficient new tramline from the Cité du Vin back to the heart of the fine old city of Bordeaux itself and ate dinner at a leafy restaurant just off the Place du Théâtre where we ordered a very fine bottle of Saint-Emilion, a highly regarded Bordeaux wine. By the way, you can if you fancy take a half-day trip to the medieval village of Saint-Emilion, classified as a UNESCO World Heritage Site. 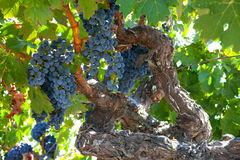 There are several of the wine-producing villages in the region offering such tours. 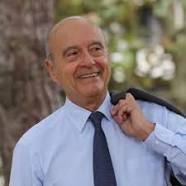 A word about Alain Juppé, mayor of Bordeaux, who was Prime Minister of France from 1995 to 1997 during Jacques Chirac's presidential tenure. 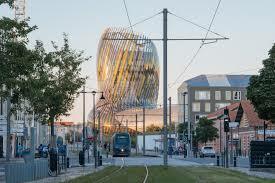 Bordeaux is a city reinventing itself for the 21st-century. Its poorer quarters are being refurbished; its waterside zones bursting into life. Juppé has transformed the city into a vibrant metropolis where inhabitants and tourists can easily interact. I was very impressed. In these days where, particularly in Britain, so many cuts are being made in the name of austerity, it was genuinely uplifting to walk about and discover a city that is working for its community, offering new opportunities and celebrating its very special history, both agricultural and urban. I asked Michel if he knew what 'claret' was. Yes, of course, a general name used by the Brits to describe a long-redundant style of wine from this region. Well, there we are. 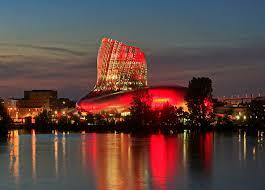 I would have loved to have spent an afternoon at the Cité du Vin with Robert Hardy. He would have thoroughly enjoyed the experience, as did we. We went there last year, a very interesting but strange place! We realised it was curated back to front, so if you start at the end it all makes a lot more sense. The chill-out area was quite an experience. Wow, it sounds wonderful! France must be on my to-visit list, as soon as I get back some of my French, which I haven’t spoken in many years(and then in Jerusalem, asking directions of a Moroccan gentleman). I was a great fan of All Creatures Great And Small, book and TV show alike, and recently downloaded it in ebook for a reread. (And I remember you, as Helen) What a lovely memory you have shared with us! Thank you!